Investigating car crash simulation in a 3D virtual environment, changing the structure of the car, initiating a new simulation, and immediately obtaining new results for VR analysis-such an environment would drastically enhance the productivity in the design and construction of car structures. 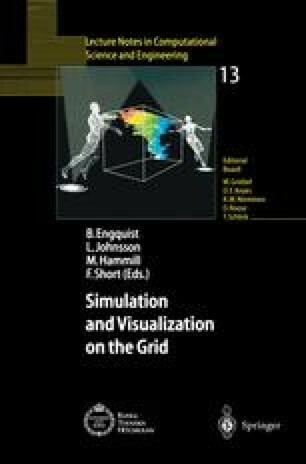 A consortium of BMW, ESI, TAN, and the institutes SCAI and IMK of GMD investigated the current situation as part of the Esprit project TTNOGMD in the context of the SIM-VR activity. A prototype developed in this project demonstrates that such an environment can be implemented. Simulation results produced by a 128-node SGI Origin 2000 are sent over the Internet and are fed directly into a VR environment (GMD’s Responsive Workbench, RWBTM), which supports the analysis of the results. Simulation parameters can be modified interactively. Acceptable response times of the crash simulation could only be achieved by improving the scalability even for medium-sized models.